Looking for the cheapest tyres, instantly available in Coventry? Since our establishment in 1990, Cheapest Tyres has guaranteed the cheapest tyres for any make and model of car or van. Based in Coventry, we stock over 10,000 new and part worn tyres in every size and brand. As tyre specialists you won’t have to wait a week for the tyre you need, we can have it replaced and fitted instantly. We guarantee we will not be beaten on price or service. Our friendly, experienced and qualified team of tyre fitters are on hand six days a week. As Coventry’s biggest and leading tyre stockist, our specialty is selling run flat tyres at unbeatable prices. Our guarantee is simple, we offer our customers the biggest range of new, part worn tyres and run flat tyres at unbeatable prices. We promise you will not find any make or model of tyre cheaper anywhere else. 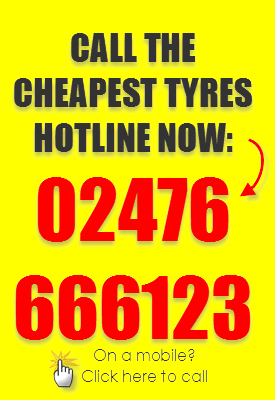 Cheapest Tyres Coventry (Bedford Budget Tyres Limited) is a company registered in England and Wales. Registered number: 04588228.